How do Crystals Work and Why is Everyone Buying them? Scroll through what’s trending on Instagram or take a walk through Urban Outfitters and you’re sure to see a healing crystal or two. What many might think to be just another accessory or trinket for your home actually goes far beyond for a more spiritual addition to life. Look, we fully understand the reputation that crystals have, often being associated with hippies and hipsters, but trust us when we say that these pretty little gems can actually bring a lot of good into your life—and even your career. So how do crystals really work? To learn more about the magic of healing crystals, we spoke with Energy Muse, a conscious lifestyle brand that provides tools of empowerment, inspiration and hope in the form of jewelry adorned with healing crystals. Before diving into what we learned, how about a bit more about Energy Muse? Take one look at their website and the fashion addict, Coachella-obsessed, festival-goer inside you will want to hop on board the healing crystal train purely based off of aesthetics. 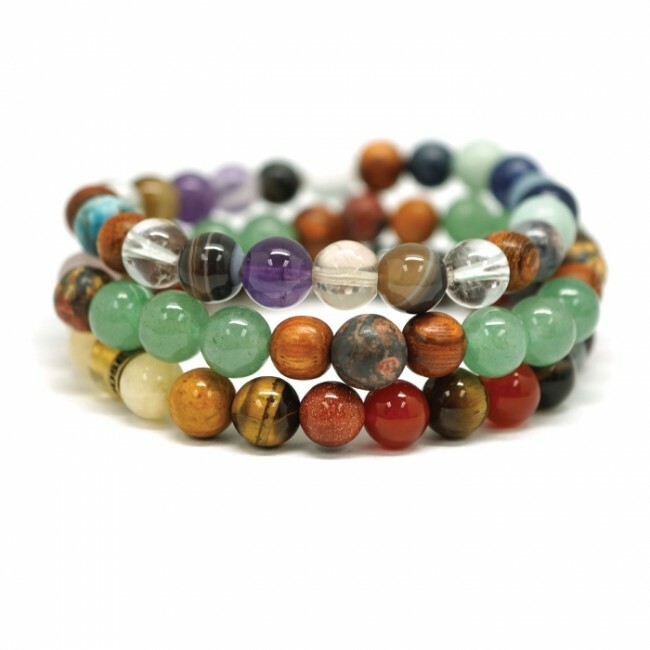 Each piece offered by Energy Muse combines crystal energy to help you tap into your inner power for a desired outcome to manifest your dreams. Handcrafted in the United States, each gemstone is cleansed, balanced and activated in a sacred healing environment for 48 hours to offer you the purest energy possible. Pretty cool, right? 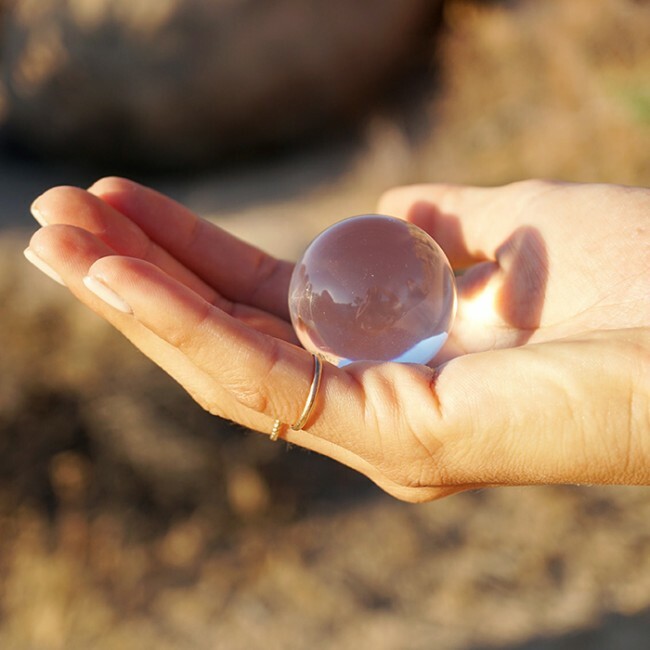 Now that you’re intrigued, let’s dive deep into a complete guide to crystal healing! Making It In Manhattan: How can healing crystals help set your life and mind up for success? Heather Askinosie and Timmi Jandro, the creators of Energy Muse: In order to obtain wealth and prosperity financially, we often need to have a breakthrough in our career. Using crystals for wealth and success will aid in taking the next steps in your career or in your newest endeavors. Crystals for success help you focus, achieve your goals and provide insight about how to do so. MM: Very cool! If you had to choose, which crystal would be best for overall success. EM: Green Jade Crystal. It is one of the best crystals for success. Its energy helps you manifest your goals and promotes the flow of abundance into your life. It also attracts new opportunities. MM: It’s really interesting how a stone can do that. If you were to recommend a stone for career success, what would it be? EM: Quartz Stone. When it comes to business and success, you want to have a clear vision for your goals and how you will be successful. Quartz crystal brings clarity to a situation and also amplifies your intention into the universe. MM: What about for the motivation needed to follow your passions and seek success in the first place? Is there a crystal for that? EM: Yes! The Tiger’s Eye Stone will give you the willpower and motivation you need in order to take action to achieve success. It will help you remained calm even in hectic situations, aiding in your ability to be a successful leader. MM: We can’t wait to try these crystals firsthand! Is there anything else we should know about healing crystals to get the most out of them? EM: Yes—when you get your crystal you’ll want to cleanse all the energy of the people who have handled and touched your crystal before it came to you. You can immerse it in the smoke of a sage stick or Palo Santo wood, place it under the sun and moon for 48 hours or place it in the soil of a houseplant for 24 hours if that’s more accessible living in an apartment in the city, and all. Once you’ve cleansed your crystal, hold it or wear it and just breathe. That’s all there is to it. Simply by holding and seeing your chosen crystal, you’re working with it and benefitting from the energy of the Earth that it carries. Let it remind you that you deserve the best. You deserve love and you deserve to feel good. Treat yourself well and respect the Earth. In divine timing, it all falls into place. And you're officially sold on the power of healing crystals, don't miss Heather Askinosie and Timmi Jandro's first book Crystal Muse: Everyday Rituals to Tune In to the Real You which comes out in October. 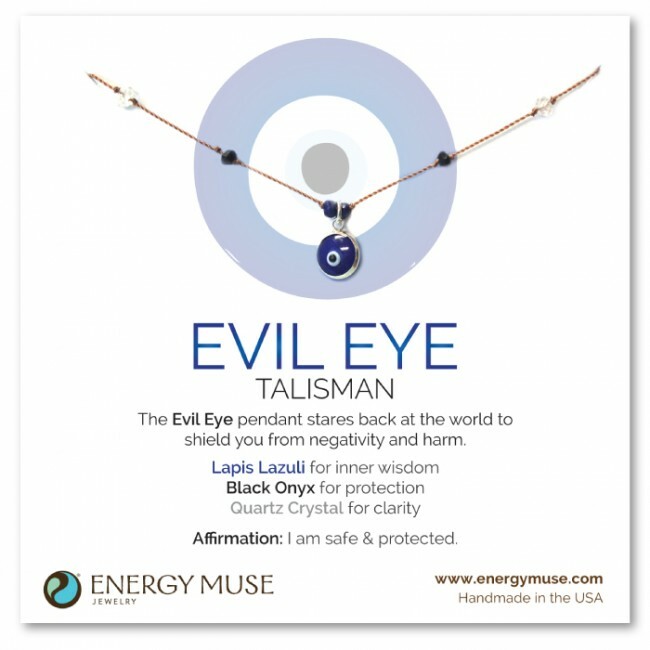 The Evil Eye Talisman Necklace: Meant to promote inner wisdom and provide protection. Free Spirit Necklace: Meant to help guide you with confidence, creativity and motivation so that you can let go of the past and invest in a bright, new future. Magically Minded Necklace: Meant to connect your mind with the infinite possibilities of the universe and fosters honest, open communication. 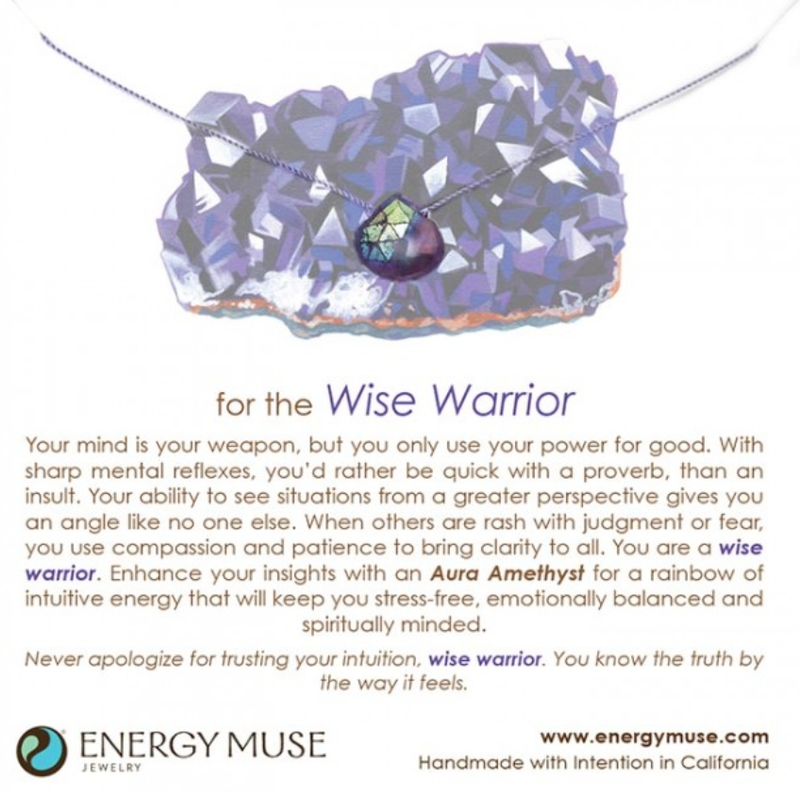 Wise Warrior Necklace: Meant to enhance your insights for a rainbow of intuitive energy that will keep you stress-free, emotionally balanced and spiritually minded. 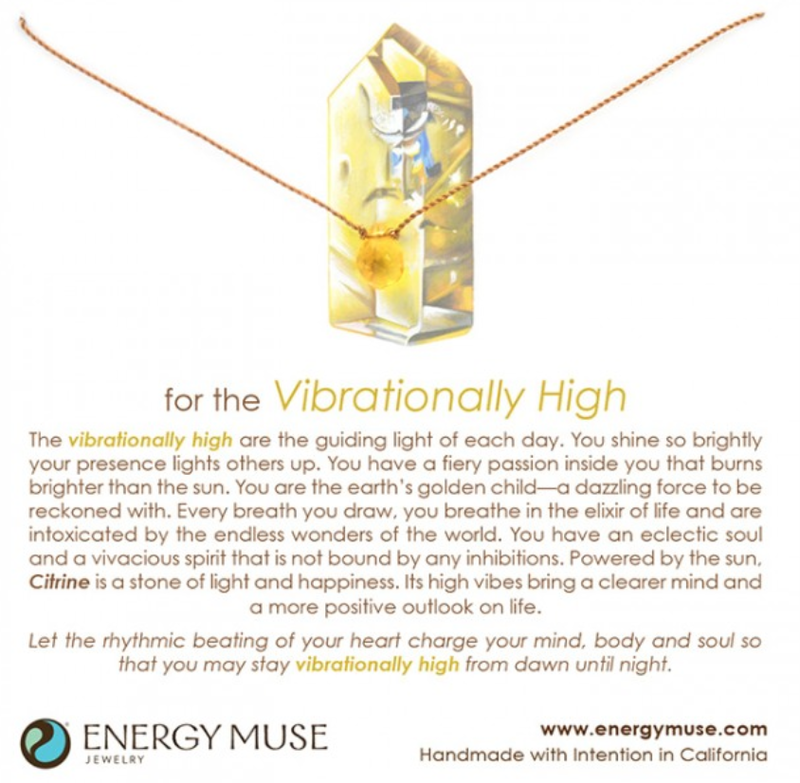 Vibrationally High Necklace: Meant to bring a clearer mind and a more positive outlook on life.